NASHCO provides a design service for builders and architects in the design proces of a construction project. With an increasing trend to use Light-Weight Steel framing in external and facade applications, many projects require complex and non-standard construction details. Fast & efficient projects – by using the Nashco design service builders and contractors experience a smooth and efficient project, with minimal site delays for engineering during construction. 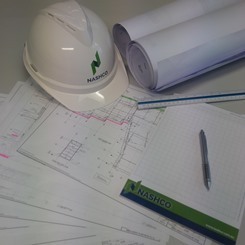 Prompt Contract – by using the Nashco design service builders typically receive tenders faster, as the Nashco Techspec provides contractors with an accurate estimation of the materials required for the project. Peace of Mind – knowing that your project has been specified by a local manufacturer gives builders, contractors and architects peace of mind knowing that everything is constructed in accordance with the relevant standards. Project Specific – the Nashco design service is tailored to your project. This means that there is no longer any interpretations of design manuals or ambiguties during construction. At NASHCO we are also committed to providing contractors on site with solutions – a solution for every problem! We recognise that things always change on site and extend our technical support service to develop solutions within the construction constraints. By providing timely and cost-effective solutions our customers have found that they reap the benefits of minimised downtime and minimal over-budget expenses on site. By drawing on over 35 years of experience in steel framing sections we are able to provide solutions in situations where traditional methods cannot be used. That is why your problem becomes our challenge!